The Kia Sorento SUV is available with a 181 hp 2.4-liter, 240 hp turbocharged 2.0-liter or 290 hp 3.3-liter V6 engine. A 6-speed automatic transmission can be paired with either front or all-wheel drive. Performance is strong when the more powerful engines are optioned and interior refinement and quality levels are up there with the best in class. Safety and luxury levels are generous even for the base trim which is a good thing as the Sorento’s pricing advantage can soon be eroded when adding additional equipment. Kia’s come an awful long way in a relatively short space of time, and that rise can perhaps be best showcased in the Kia Sorento SUV family. What started out in the previous decade as an affordable alternative has now morphed into a genuinely good car that has more than just value for money as a defining USP. 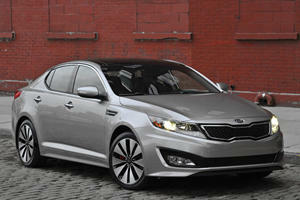 It really is an impressive achievement, but that doesn’t mean the Kia has scored a homerun here. Rivals like the Ford Edge, Mazda CX-9 and Nissan Rogue are all incredibly tough competitors for the Sorento to overthrow – so does the Kia have the goods to tussle with the best in class? Most of the materials you’ll find in the Kia Sorento, for instance, will be soft-touch plastics that are on par quality-wise with what you’d find in a comparably-priced Volkswagen. Kia’s been making a push over the years into the more premium end of the market, and the latest Sorento is perhaps the perfect embodiment of that. Considering the old car’s cabin wasn’t what you’d call ‘low rent’, it’s testament to how far the new Kia has come along that we’re praising the current Sorento’s interior as a big step up from its predecessor. Most of the materials you’ll find in the Kia Sorento, for instance, will be soft-touch plastics that are on par quality-wise with what you’d find in a comparably-priced Volkswagen. Likewise, the simplified control layout makes the main controls easy to use on the move whilst simultaneously decluttering the center console. That’s not to say Kia’s gone on a complete button purge in the Sorento, though – we found navigating through the touchscreen interface’s myriad menus noticeably easier in the Sorento than on equivalent cars, thanks to the shortcut buttons on the sides of the display. Buyers who opt for the five-seater Kia Sorento will have a rather spacious mid-sized crossover on their hands. Storage cubbies aplenty are dotted about the cabin, and there’s good overall levels of leg and head room on offer in the front and back seats, with particular mention going to the completely flat floor in front of the back seats (usually on crossovers with all-wheel drive options, there’s a large transmission tunnel that runs down the length of the car, meaning the person sitting in the middle rear seat often has a limited amount of room to place their feet). If you need to have a seven-seater Sorento, however, you will have to make a few sacrifices with regards to interior space. Stick with the five-seater models, and you’ll also have yourself a decent amount of trunk space to play with. At 38 cubic feet, the space on offer is okay by class standards, and the back row folds down completely flat to add another 35 cubic feet to the mix (again, good, but still short of what a Honda Pilot and Toyota Highlander can achieve). Still, the load bay itself is big enough for most buyers, and the combination of a wide opening and small load lip means sliding in and out more cumbersome items should be fairly simple. If you need to have a seven-seater Sorento, however, you will have to make a few sacrifices with regards to interior space. The two rear seats here aren’t as comfortable as the other five chairs, and the even more restrictive head and leg room levels here means you’ll only get away with cramming adults in there for short journeys at a time. Plus, having all seven seats in place means you’ll only have 11 cubic feet of cargo space (in comparison, the Sorento’s sister car – the Hyundai Santa Fe – has a trunk capacity of 13 cubic feet with all seven seats in place). Granted, a vehicle the size of the Sorento was never going to be as nimble in built-up areas as a compact sedan. Often with big SUVs, it’s easy to zero in on an area where it’s lagging behind the competition in some regard. Some may lack ride comfort, others may be noisy at the motorway and a handful manage to combine those two together in one package (we’re looking at you in particular, Mr. Toyota 4Runner). With the Kia Sorento, however, things are slightly different, as we can’t think of a single area where the car feels compromised somewhere when you’re behind the wheel. For instance, even though the Kia Sorento’s stable body movement, comfy seats and excellent noise insulation make it ideally suited for life on the highway (we reckon the Sorento’s comfortably one of the most hushed cars in this class at higher speeds), that hasn’t translated to awkward handling dynamics when you’re threading the big SUV through city streets. Granted, a vehicle the size of the Sorento was never going to be as nimble in built-up areas as a compact sedan, but we are very impressed with the Kia’s manners in tighter sections of road. There’s good all-round visibility, so you can place the car where you want to, and the light controls make the Sorento a relative doddle to drive about at slower speeds. The Sorento can navigate tighter corners without washing wide into understeer suppressing body lean surprisingly well. The Sorento even laps it all up when you’re tackling tighter sections of asphalt. As with the town driving point we made earlier, we’re not saying the Kia is built to be thrashed hard (and, if we’re being honest, the Ford Edge is the more enjoyable car to drive down a twisty road), but the Sorento can navigate tighter corners without washing wide into understeer; suppressing body lean surprisingly well. In fact, the only time we ever found the Sorento to struggle hiding its vast bulk is during successive, slalom-esque direction changes – which we’ll let the Kia off on, given we doubt many owners will be frequently assessing how much lateral grip their big crossover has. If we have any real criticism of the car, it’s that the Kia Sorento doesn’t really fare that well as an off-roader. Even in all-wheel drive guise, the Kia will struggle to conquer anything more arduous than a rather rutted farmer’s field, and pales in comparison to what a Jeep Grand Cherokee can manage. Yes, we feel it’s the worst engine in the range, but that doesn’t immediately make it a bad one. At first glance, that sub-heading seems to indicate that we have overwhelmingly negative opinions on the Kia Sorento’s starter engine (a 2.4-liter four-cylinder gasoline unit). That’s not the exact case, however – yes, we feel it’s the worst engine in the range, but that doesn’t immediately make it a bad one. On the contrary, the 2.4-liter unit is alright in day-to-day circumstances. It’s got the best on-paper running costs (though, with lows of 19mpg and highs of 28mpg, they’re not amazing for this class), and the engine’s smooth and refined characteristics make it a pleasant engine that’s well suited for long distance cruisers. The 2.4-liter also has the benefit of being available in the more affordable trim options and, unlike the five-seater-exclusive 2.0-liter turbocharged gas engine, can also be installed in seven-seater Sorento models. Where the 2.4-liter loses out, however, is in the power and torque stakes. Even with a slick-shifting six-speed automatic transmission, the Kia Sorento in this guise does need a bit of coaxing to get up to speed – a result of the 185-hp and 178lb/ft of torque outputs being reached fairly higher up in the engine’s rev range. As a result, not only will you need to leave a bit of run-up room in order to get the Kia up to speed, but those economy figures might drop noticeably in real-world instances as a result of having to use a large portion of the Sorento’s rev band in order to maintain momentum. We’d recommend going for the 2.0-liter turbocharged four-cylinder gasoline engine. As a result, if your budget stretches far enough, we’d recommend going for the 2.0-liter turbocharged four-cylinder gasoline engine. It’s a more flexible engine than the 2.4-liter, thanks to the 240-hp it produces and the 280lb/ft of torque that’s available from just 1,450rpm, and its smaller capacity means this 2.0-liter is roughly on par on paper with the larger, less powerful equivalent (like for like, there’s roughly a 2mpg difference in between the two engines). The only downside with the 2.0-liter engine, apart from five-seater configuration restriction we mentioned earlier, is that it’s only available in one trim level – with that model’s MSRP starting at $31,500. Buyers looking for the optimum grunt available in their Kia Sorento will want to opt for the flagship engine in the range: a 3.3-liter six-cylinder gasoline engine. 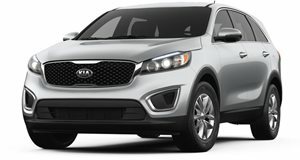 As with the 2.4-liter engine, it’s available in a wide variety of Sorento configurations (only the entry-level ‘L’ trim is denied access to the six-cylinder engine), and the large capacity means it has plenty of grunt – meaning it’s the one we’re more inclined to recommend if you tow items on a regular basis. Fuel economy does take a hit, however, with even the most efficient models being able to return 25mpg on the highway and just 18mpg in the city. That’s not to say the Kia Sorento doesn’t have any real pricing advantage. 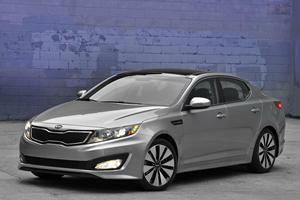 Remember the days when you could buy a Kia that was several thousand dollars cheaper than its main rivals? They seem quite a long time ago now, don’t they? Gone are the budget prices and the emphasis on value: nowadays, Kia’s surge in quality over the years has resulted in a rise in MSRPs, and the Sorento’s similar pricing level with a vast majority of rivals is perhaps the biggest indicator of that trend. That’s not to say the Kia Sorento doesn’t have any real pricing advantage. In like-for-like configurations, rivals such as the Nissan Pathfinder and Honda Pilot do emerge as more expensive vehicles to buy, especially in the lower trim levels. A good reason for this is the decent amount of standard equipment that comes on the various specs: all Sorentos from ‘L’ spec upwards come with cruise control, keyless entry and Bluetooth connectivity, with the ‘LX’ trim a peg higher up the pecking order adding a reversing camera and a 4.3-inch multimedia interface to the mix. Factor in the other optional extras that are available on the ‘LX’ – namely climate control, heated front seats, autonomous emergency braking, lane departure warning and the second row of seats that can slide forwards and backwards – and it’s easy to see why we reckon this spec is where you should start looking for your ideal Kia Sorento. However, do be wary of some of those options, as many are lumped together in packages that, though reasonably priced in isolation, can turn the Kia into a pricey crossover. No matter which Sorento model you go for, you’ll have yourself a very safe mid-sized crossover. Buyers who plump for the ‘EX’ model will also get a lot of the LX’s optional features as standard, along with extras like leather seats and, for an added cost, useful features such as a blind spot monitoring system. EX-spec Kia Sorentos also come in at an MSRP that marginally undercuts a fair few competitors, though – as the price does genuinely balloon from this point onwards – we’d hesitate on telling most Sorento buyers to look further up this particular Kia’s price lists. No matter which Sorento model you go for, you’ll have yourself a very safe mid-sized crossover. 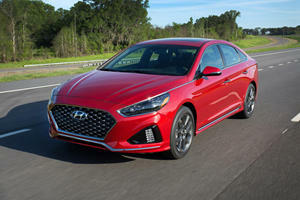 All models come with a full complement of airbags and stability control systems, with those further up the pecking order being lavished with other pieces such as lane departure warning and forward collision alert systems, and the car scored the maximum five-star rating in its most recent NHTSA crash test. Even insurers are taking note of these engine fires.